Today in the rock room I have reconstructed a legendary "unreleased" record by rock legends The Kinks. Fortunately, all of the tracks for this record are available on other official releases. So, this LP is not a "bootleg" so to speak, but an interesting compilation of tracks destined for other representations, and for future times. The LP "Four More Respected Gentleman" was supposed to be the United States album release of what would eventually become "The Village Green Preservation Society", in a round about way. It was in mid 1968 when The Kinks delivered to their record company a 15 track LP that was being readied for a fall release. Information is sketchy, but according to Kinks scholar Doug Hinman indecision by Ray Davies, as well as misgivings about the demand for Kinks product in the US factored into LP's eventual disappearance from the Reprise catalog. 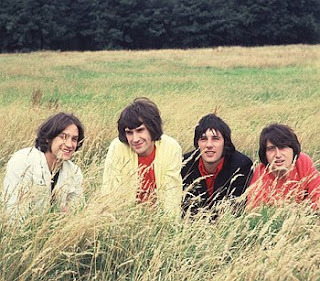 The Kinks were not allowed to return to the US to tour as of yet, so their popularity was concentrated in Britain, and was believed to be waning in the states. The eventual release of the concept album "The Village Green Preservation Society" ended up containing many of the same tracks as the planned "Four More Respected Gentleman", LP as well as many songs that ended up on future Kinks singles, and compilation albums. Gathering these tracks from the various releases and listening to them as a "real" LP is an enlightening experience, full of rock detective work! Obviously "Village Green" is now recognized as a highly influential LP, and one of the first "concept" records, but diving into its genesis offers a unique view of its construction. Ray Davies had the idea for a highly different release for the American market, and was disappointed when it did not come to fruition. He also was planning a solo LP so some of his cache of songs was to be spread between the two records. "Village Green" eventually became a fifteen track British release, and "Four More Respected Gentleman" was stripped from fifteen tracks to eleven and then eventually withdrawn from release. Reprise Records had even created a catalog number for the LP (RS 6309), so it was very close to becoming a tangible object. In fact, a track listing does exist and acetates were cut, so an authentic listening experience is possible! The unreleased LP finds the Kinks in a defining moment of their careers, on the verge of breaking back into the US, but floating in the "grey area" between their early jagged R and B punk days, and their mature and blossoming musical storytelling future. Both of the Davies brothers are reaching creative peaks in their songwriting and instrumentation during this period, culminating with the songs "Village Green", and this mysterious aforementioned LP. The "album" opens with "She's Got Everything", a track that sounds like it could have been pulled from any of "The Kinks" earlier releases, which is the case, as the song dates from 1966. A chunky revolving riff decorated with some jangling rock and roll piano. 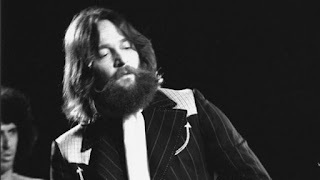 The guitar solo segment of the song emphasizes the "rave up" technique of Dave Davies early guitar explorations. A solid LP opener and an obvious choice for a proposed US release as it recalls the heady "You Really Got Me" days of the band. The first side of the LP now drifts into a stoney groove with a series full band, but acoustic orientated Ray Davies masterpieces. "Monica" sways with a ethnic and sexual groove. Accented by staccato Dave Davies guitar strums, and melodic tribal percussion by Mick Avory. Ray croons in his most distinguished fashion, declaring his love for "Monica" his woman of the evening. The song feels different in this position, changed from its next to last song slot on "The Village Green Preservation Society" LP. A definite coherence can be felt in this LP, and as I previously stated, Ray Davies had a plan for this record as well as for his supposed "solo" LP, which morphed into "Village Green". The first two tracks on the LP both view a woman who seems to have everything, including the narrators heart. It doesn't seem as if the singer can make it, "I shall die if I should lose Monica" without the object of his affection. The following song, "Mr. Songbird" is unabashedly poppy, and warmly emanates positivity like a shiny summer day. The verse of the "Mr. Songbird" is distinctly "McCartney-esque", and leads into the carefree request of the chorus, to "help me keep my troubles away". Breezy keyboards glance by the vocals adding a breathy second voice. Again, the sparse acoustic concentrated arrangement, and tasteful instrumentation keeps the focus on the lyrics and the clean sound. I feel like the narrator of the record is starting to gain confidence, after the submissiveness of the first two songs. "Johnny Thunder" is the culmination of this new gained confidence, as the music also mirrors this belief. Shimmering guitars by the Davies brothers work as one instrument, as Pete Quaife's bass groundhogs in and out of the mix. Sewing his oats, the narrator crashes and flashes throughout the scenes of the song like "thunder and lightning". "Johnny Thunder's character equivalent "Polly" makes an appearance next, leaves home, and then comes back again. Ray Davies in these last two tracks has identified the male's and females in his audience, and expressed some of their misgivings through his artistic voice. The "alpha" and testosterone of his male listeners characterized in "Johnny Thunder". The longing and regret of Ray's ladies sketched in musical notes by the pretty "Polly". I like these two emotive songs in this back to back line up, drawing contrast between the two distinct characters. Side one closes with the beloved Kinks song "Days", a song of hope, and a song thanking a someone who has left by choice, or has been taken away. "Days" fits perfectly in this closing slot on the hypothetical records first side, a statement of finality, but yet hopefulness. An uptempo ballad in which the instrumentation lends an air or triumph to the bittersweet lyrics. The supposed second side of the record opens with a personal favorite of mine, "Animal Farm", its lyrics dealing with how easy life was, or could be, if taken simply, and going to where the animals live. A song of reflection, and hope for change. An uptempo and beautifully melodic start to the second half of music. It could be just me listening with a great intent, but I love how this record has an organic and thematic flow, even though it, and was not designed as a concept so to speak has never seen the light of day officially! "Berkeley Mews" opens in a saloon, a standup piano playing in the far corner of the bar. As Ray's lyrics pour from his mouth like serving a top shelf whiskey, Quaife's electric bass thumps out the backbone of the song. "Berkeley Mews" is again a reflection of time spent and how the place epitomizes that time. "Berkeley Mews" is the place our meaningful narrator had left for the "Animal Farm" in his thoughts. Kinks klassic "Picture Book" shimmies itself across the boardwalk like an exhibitionist at a nudie show. It' ascending rolling groove the most "moving" of all of the songs on the record. The track is, similar to the previous songs, a holding on to and paying respect to the past. What "Village Green" would become, is found on this record in its basic elements. The emotions and thematic content of Ray's view of rural life for an English person, can also be found in their entirety on this unreleased record. Numerous small vignettes make up the bigger portrait that Ray Davies envisioned, the next song "Phenomenal Cat" is one of these detailed snapshots. What sounds like a fleet of cartoon flute players, acts as a prelude to the song. The content of the song is a cat who "in the land of idiot boys" does what he likes and is contented for it. There can be many interpretations for the symbolism contained in this song, much too much, for my meager literally analysis. But the song does deal in personal choice, and the music plays with a child like curiosity. The wordless sing along chorus adds to the fairytale delivery of the words. Closing the unreleased album and collection of songs is the track "Misty Water". Piano based in its delivery, "Misty Water" elicits the belief lyrically that things that people do not like, or fear, can often be beautiful and misinterpreted. Finding like minded people in your pursuits and beliefs can be beneficial to all involved. Alluringly portrayed by Ray Davies through the images of "Misty Water", haze, fog, and mist, the narrator ultimately finds what he is looking for through the connected interest in all things "foggy". The narrator takes a chance at the end of the record, and through experimentation, willingness and courage finds the things he longs for. The song rocks confidently through the chorus, falling back on the verses, a bubbling brook of words tumbling over the rocky instrumentation. Meeting around a stocky Dave Davies guitar interlude the song navigates the nebulous landscape ending the album slightly wet but none the worse for wear. I had great fun reconstructing and listening to this missing link in Kinks history. While many of the songs have permanent homes on other records, enjoying them in this context gave them a new life and unique placement. The era in which this music was created is important in the Kinks history as well, as soon after this time they would again reach astronomical popularity in the States starting with the "Arthur" LP, and then detonating the "Lola" single. If you are so inclined, take the time to search your collection, and put together your own version of "Four More Respected Gentleman", it will be time well spent. The album feels good, sounds good, and lets us as listeners in on a period piece that never saw the light of day, and probably never will! Nifty essay, thanks! But doesn't Animal Farm open side two of VGPS? Yes...thanks for that. Sometimes I need an editor! There is nothing to suggest that the 'Then Now and In-between' promo album art work had anything to do with 'Four More Respected Gentleman' album as they were projects over two years apart. The 'TNAI' album uses a previously used image taken at the 'Something Else' photo shot, and as the follow up album to 'SE' was highly unlikely to have been used again on the follow up. Indeed copy for the albums labels was printed and does exist.It was common practice at the time for labels to make reference acetates and personally would not read to much in there existence. However, unlike the 'God Save the Kinks' and and a early version of 'Kink Kronikles' albums, no art work has surfaced to date. I'm not saying artwork was not prepared, the chances are it was, but the 'TNAI' is not it. It's likely that 'INAI' and the 'God Save the Kinks' box set from whence it came from, that the Kinks had very little input into, as it was not a full commercial release. At the time the Kinks had two separate record contracts with equally disparate requirements, with Pye being perhaps a little more relaxed in there delivery and timescales. Whilst undoubtedly a true Kinks project and was themed, but there was a bigger end game. The fact that the 'FMRG' album was made up of a selection of new songs and older songs unreleased in the US says a lot,it was undoubtedly a holding piece by them or their management. What eventually happened was, simply the recording and production of the 'The Village Green Preservation Society' album caught up with 'FRGM' and was identified as being far superior(which it was)and was worth hanging around for, which Warner Reprise recognised. I have not seen any suggestion that 'FMRG' was anything but an 11 track album. Back then, US albums were routinely 10/11 tracks (the extant label copy confirms this)and UK they were 12/13 tracks in composition. The Kinks would have been sending through tapes to Reprise all the time of anything that was released in the UK and Europe for consideration for US release, so there is where perhaps the confusion arises. Anyway it's nice to see this nugget exhumed and discussed. Hi Russell. Thank you for adding some clarity and information to my rant. As you stated, it is an era very hard to find relevant information on. It escapes me now but I remember reading somewhere that the TNAI artwork was revisited for the possible FMRG LP. Your explanation clears it up. Thanks for reading. Because the 'TNAI' and 'FRGM' are to different degrees 'mythical' and from the same era they I suspect they get lumped together and there are various associations and implications. 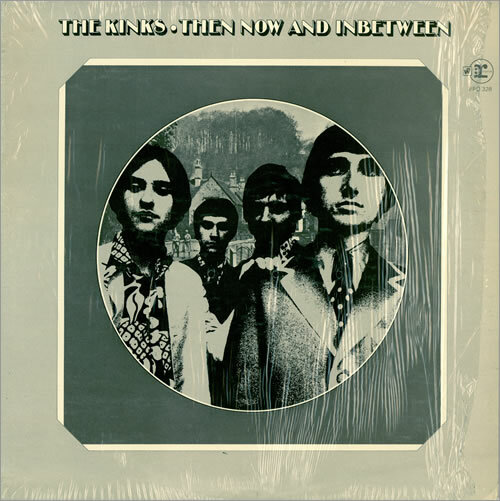 I as someone who has more access than most to the Kinks archive have yet to find a connection between the two aforementioned albums, other than the odd track cross over. 'The Village Green Preservation Society' was groundbreaking in so many ways (mostly not recognised until many years after) but even when albums were stretching out in the late '60s, 15 tracks (albeit relatively short tracks) for a US album was far from the norm. Pye were most certainly not EMI when it came to record keeping and picking through the embers can be tricky at times and a bit of deduction is required from time-to-time to fill in the gaps. But, I'm clear on this one.